The 2012 edition of NFPA 99 offers a risk-based approach for better occupant safety in health care environments. Benefit from the industry's best instruction on the Code recently adopted by CMS. The U.S. Centers for Medicare & Medicaid Services (CMS) has officially adopted the 2012 edition of NFPA 99, Health Care Facilities Code. 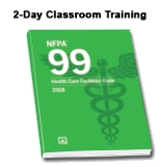 NFPA®'s expert-led two-day training program explains what's different about the 2012 edition of NFPA 99 and how will it impact your work in all types of health care settings. Learn about NFPA 99 through two days of in-person training. Dramatic changes in the renamed NFPA 99, Health Care Facilities Code reflect today's environment of patient care where procedures are performed in a wide variety of locations -- requiring safety guidelines based on a risk-based framework to facilitate adoption and enforcement throughout an increasingly decentralized health care system. In this collaborative program, health care authorities and Code experts guide you through NFPA 99's revised content and complete reorganization, taking an in-depth look at how to conduct a risk-based analysis. Interactive training involves hands-on exercises and activities to give you a working knowledge of the Code. Jonathan Hart, Senior Fire Protection Engineer at NFPA® talks about NFPA 99 classroom training and how it relates to the CMS announcement. Earn 1.4 CEUs or 14 hours for this 2-day classroom training. Attendance is required to earn CEUs. Please verify applicability with your professional board before attending.